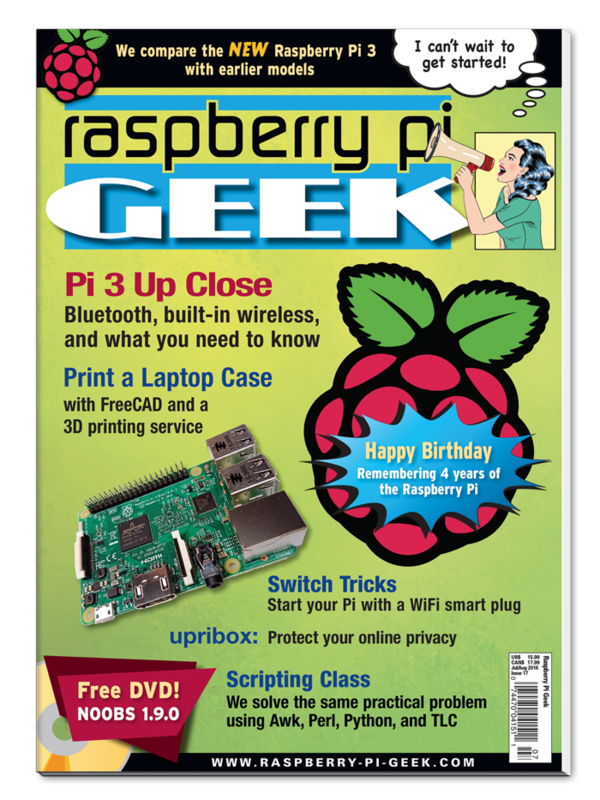 The Raspberry Pi celebrates its fourth anniversary. We review the history of the nifty nanocomputer. How much extra power can a solar panel collect by tracking the sun? Man pages provide essential information but may seem cryptic if you’re not familiar with their structure. We introduce you to the native help system for Linux commands. Offload the CPU-intensive compilation tasks from the Raspberry Pi to other computers. This computer-aided design software works well on a Raspberry Pi. Intercept tracking and advertising before it gets to your devices. Program a smart plug to start your Pi on a schedule. Turn a Raspberry Pi into a communication center for sending and receiving text. Build your own laptop case with FreeCAD and a 3D printing service. An upgraded conference slide projection apparatus with some retro design. Program an Android phone to control a toy water craft. What’s new in small-board computers, Internet of Things, and the Maker realm.